The other day I happened to watch the Planet Earth 2 series aired in BBC. Its a beautiful program especially to those who love to watch the nature. I happened to watch two series back to back and two scenes won’t go away from my head. The more I thought on it God was giving me an insight on the issues and wanted to share the thoughts with you. In the first one a buffalo is taking rest in a puddle of water, were a Komodo Dragon come sneaking behind the buffalo and tries to attack him. The buffalo senses the danger and it tries to chase the dragon away and the dragon back off. The buffalo is no match to the dragon. The buffalo could have easily run away into wildernesses and the dragon is not fast enough to chase him or to attack him, but the buffalo chose to wait and watch! And as he was watching closely the dragon appeared to be harmless and quiet, but in an instance when the buffalo turned its attention, the dragon seizes the opportunity and gives a bite on its rear right ankle! And that’s all what it needs! Just one bite, nothing more, a flesh wound! No second bites! 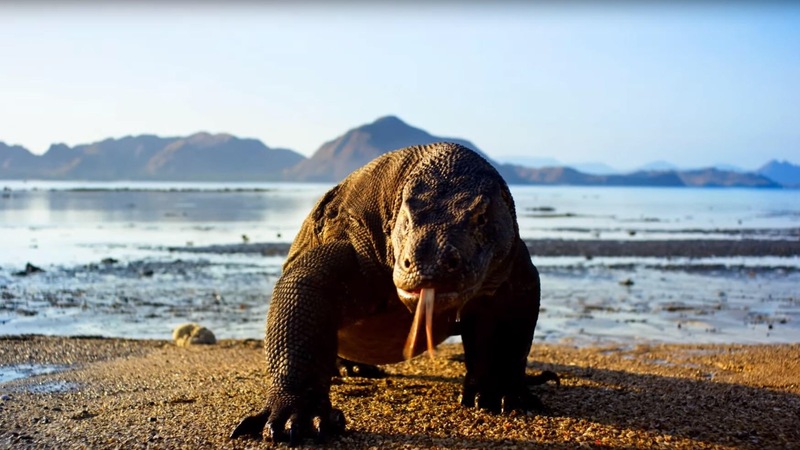 The secret weapon of the Komodo Dragon is a specific set of bacteria, that it injects into the bloodstream of the prey, through a bite. This will weaken the immune system of the prey and will bring it down in few days. This bite also involve a little of bleeding from the buffalo which attracts other dragons in the surrounding. Soon these dragons begins to closely follow the buffalo wherever it goes. They keep following the buffalo for days and weeks. The flesh wound on the leg gets healed! But the dragon’s secret weapon is still in place! The bacterial load weakens the buffalo each passing day and in three weeks time the buffalo finally gives away and dies! All the dragons who been following this buffalo from the day of bite comes together and devour their prey and in minutes the buffalo becomes a pile of skeleton! 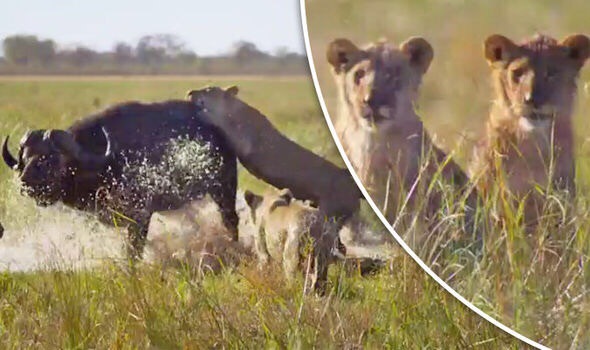 Now, in the next series the grasslands, a buffalo is surrounded by a pride of lions! Everybody knows how strong the lions are and we don’t even see an opportunity for the buffalo to stand before the lions. 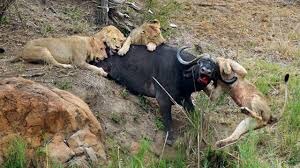 These lions, they attack the buffalo from all sides and one lion happens to bite and hang on the back of the buffalo creating a deep wound and bleeding profusely. Those who watch it will say the buffalo is no match to those lions. But surprisingly the buffalo remains calm and then it shrugs and throws the lion away and runs into safety! Even though it got a deep scar, it will heal away in time! The more I thought on these God reveled me a secret which I want to share with you. The buffalo in first scenario is a normal human who is living and leading a life normal but not accepted Jesus as Lord and saviour of his life. The devil (dragon) spots him and try to get him into sin (venom). The man recognizes the danger and tries to stay away and the dragon appears to stop for some time and then starts following him again. The man watches carefully and tries to avoid the attack of the devil. But instead of running away from the devil, the man keeps staring on the devil to see what is it and how he looks and all that and the devil seizes the opportunity and bites and makes him infected with sin. One bite no more. Now the devil follows him like the dragon and soon lots of other devils also join and keeps following the man! Soon the bite will be healed but the infection of sin inside the system of the human will consume away the contact of man with God and he becomes spiritually weak day by day and one day the spiritual man dies and the devils devour the man’s life! Where as in the second scenario the buffalo is the man who had accepted Jesus as his Lord and Saviour and leading a holy life is facing a trial where the devil is more powerful than the dragon, the lions. The lions (devils) tries to attack the man back and forth and some even looks they accomplished performing the task and leaves deep wounds. But since the man is brought by the blood of Jesus, God won’t allow him to fall down, but gives him the ability to face the evil and to run away out of it safely. Even though he got hurt, God will heal him and will live doing the purpose of what God have got for him in life. Those who accepted Jesus Christ as their Lord and Saviour of life can only lead a victorious life over sin. If you don’t accept Jesus in life your life is soon going to be according to scenario one where one dragon, weighs much less to the buffalo, one bite lead to the death. Where as if you’re a born again Christian and leading a holy life, you might encounter bigger enemies than you and everyone will say that’s it, that’s the end of you! But the spirit of God living inside you will enable you to raise up even when you are weak and will help you to succeed over your enemies and will help you do the purpose what God has made you for! So how to accept Jesus as your Lord and Saviour in your life? Say this prayer by believing in your heart and confessing by mouth. May God Bless You and help you to lead a victorious Christian life as how God pleases in your life. Surely God’s plan is not to harm you, but is to give you hope and great future! God bless you!! !